TThe Third Party Inspection for Gas Turbine article provides a sample procedure for gas turbine inspection and testing in the manufacturing shop. The article should be reviewed with gas turbine inspection and test paln. This content guides you through all necessary stages in the production of the gas turbine, including the inspection of raw material to the final inspection, preservation and packing, and dispatch to site. You need to take this point into account: this article is written for a typical gas turbine and might not be detailed for special cases. This content may be useful for second party inspectors, gas turbine manufacturer quality control personnel, engineering companies, and purchasers, as well. All gas turbine inspection and testing is done against the approved drawings, purchase order specifications, purchasers or company standards, and within the practices and rules of the country, state or province and any government decrees, laws, ordinance or regulation as may apply. This content is useful primarily to open cycle combustion gas turbine units for mechanical drive operations and does not apply to the hot gas generator sets in industrial use of the aircraft pod type. The applicable codes and standards may be based on other international standards such as JIS B8041, etc. This content is general and can be useful even if the design code is different from the API Code. The list of documents normally is agreed upon in the Pre-Inspection meeting, which is held several weeks before the actual commencement of the inspection work. The parties that participate in this meeting are the manufacturer, purchaser and third party inspection agency representatives. The first actual inspection work in the gas turbine is the raw materials inspection. The original or authenticated copies of mill certificates of material normally are available at the manufacturer's premises. The third party inspector examines these certificates for compliance with specifications, and where appropriate, drawings. Then the inspector witnesses the materials identification on the certificates against the materials marking. It is also necessary to check these with the gas turbine drawing datasheet, material list and other specifications as appropriate. 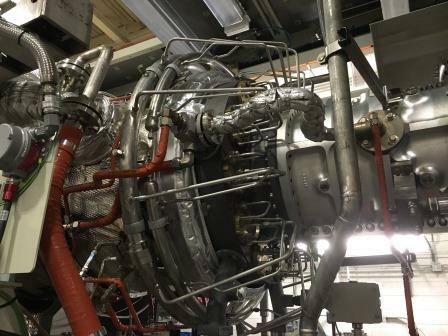 When the gas turbine material inspection is carried out, and the results were satisfactory or non-conformities were closed by remedial action, then the gas turbine manufacturer will start fabrication. The third party inspector checks the following points on the gas turbine based on the inspection and test plan (ITP), which has already been agreed upon between the purchaser and the gas turbine manufacturer. The third party inspector verifies that the correct test pressure has been applied to the relevant parts depending on specification requirements. When required by the contract or purchase order, the third party inspector witnesses the measurement of the residual out of balance force by dynamic testing and approves the results. When required by the contract or purchase order, the third party inspector witnesses the rotor shaft overspeed test and approves the results. When required by the contract or purchase order, gas turbine is subjected to a mechanical running test. When required by the code, contract or order, gas turbine is subjected to a governor test. After completion of all testing a visual examination including a partial strip down of the unit is usually required by the specification and is witnessed by third party inspector. The third party inspector checks the content in accordance with the approved drawings and specifications and make sure it is stamped in accordance with the code requirements. It is necessary that surface condition is free from pin-holes, runs damage and other discontinuity. Spare parts, loose items and accessories are checked visually for their dimensions, materials, workmanship and quantity, according to the purchase order specification. Test marks and tags are checked for correct identification. The third party inspector provides an Inspection Visit Report (IVR) after each visit, as well as a final report summarizing the activities carried out during the gas turbine production in accordance with the contract requirements and circulated within the time limits specified in the contract. The report is in the format required by the client and clearly indicates final acceptance or rejection of the gas turbine. When required by the contract or purchase order, a release note is issued by the third party inspection agency and given to the manufacturer when the gas turbines have been accepted. All exterior machined surfaces are coated with rust preventative.